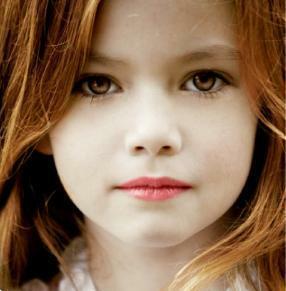 Mackenzie Foy aka Renesmee Cullen. Finally, our Renesmee is here! :). Wallpaper and background images in the Serie Crepúsculo club tagged: renesmee cullen renesmee cullen renesmee carlie cullen carlie mackenzie foy mackenzie foy actress breaking dawn. This Serie Crepúsculo photo contains retrato, tiro en la cabeza, primer, headshot, primer plano, en la cabeza, and closeup. There might also be atractivo, picor, and atracción.